Following an inspiring comparative exploration of the Italian operatic scene in the late nineteenth century and in the first half of the twentieth, “Risorgimento strumentale” (Instrumental Renaissance) is a comprehensive series devoted to the valiant composers who succeeded in reinvigorating Italian instrumental music in the same period by rediscovering the diverse and luxuriant heritage of Italian pre-Romantic music and merging it with Romantic innovations, avant-garde research and modern instrumental technique. 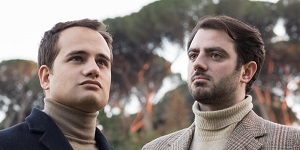 The Italian Cultural Institute is proud to welcome the pianists Giulio Biddau and Norberto C. Respighi, to give a concert dedicated to the illustrious ancestor of one of the performers and to the composer’s sincere and intense friendship with Alfredo Casella, another giant of Generazione dell’Ottanta (Generation of the 1880s). For this reason the programme of the event includes many works composed by Ottorino Respighi for piano four hands and often consisting in refined and twinkling transcriptions of some of his symphonic masterpieces; it compares them with a towering four-hand piano score which shows the strong influence of Futurism on Casella; and it stresses that both composers shared a deep interest in ancient genres and pre-Romantic patterns. Finally the programme of the concert ideally relates Casella and Respighi to their earliest Italian forerunner as a piano virtuoso, as a transcriber and as an instrumental composer, Giovanni Sgambati.